Looking for a product you saw in Child's Play 2? Chances are we have found it. 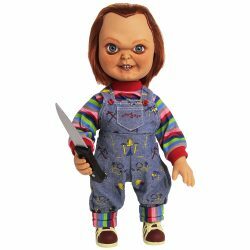 Have a look at all the Child's Play 2 products we found here. Missing something? Let us know!
" Hi, I'm... Tommy, and I'm your friend to the end! Hidey-ho! Ha, ha, ha! " " Did you miss me Andy? I sure missed you. " " You have been very naughty Miss Kettlewell! "